I have learned many new plants in my three months at the Scott Arboretum. In fact, it would not be an exaggeration to say I learn a new plant every day. One of the very first plants I learned upon starting work here, though, was not a cutting-edge cultivar or a unique specimen tree. It was a plant with quite a reputation around these parts, not for its aesthetic appeal, but instead for its stubbornness and invasiveness. This month’s Plant of the Month is the weedy Pinellia ternata. The volunteer who first introduced me to Pinellia described this invasive plant with a tone of loathing and detestation. If memory serves me correctly, I believe she described Pinellia as the “bane of [her] gardening existence.” At the time, I thought that was a pretty strong statement for such a small weed. But, after three months of first-hand experience with this seemingly ineradicable plant that always reappears with gusto, I now understand what the volunteer meant. Pinellia ternata is native to Japan and is sometimes referred to as cow-dipper. 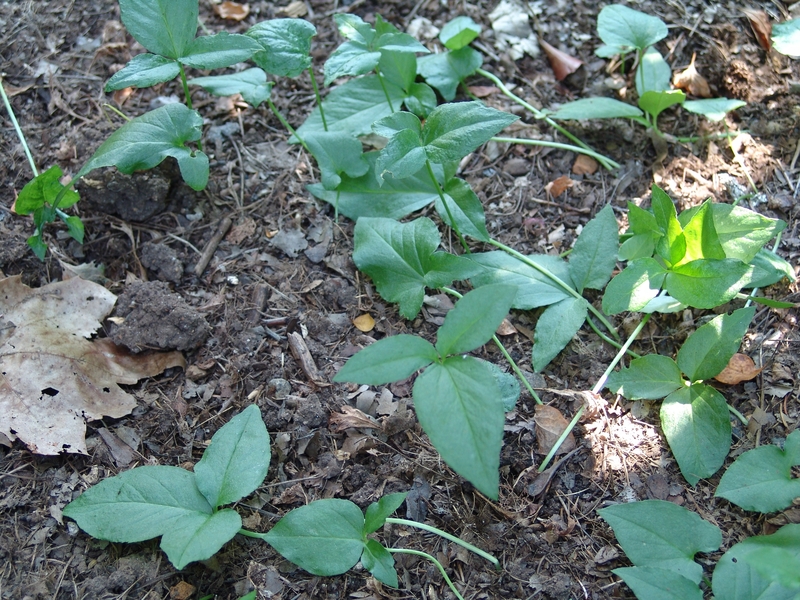 The plant possesses trifoliate leaves and a flower typical to plants in the Araceae family (think of a jack-in-the-pulpit with its spathe and spadix flower). Similar to other Araceae plants, the flowers of Pinellia are hermaphroditic. One of the secrets of Pinellia ternata‘s success is that its stem regenerates from a corm that resides inches below the soil’s surface. 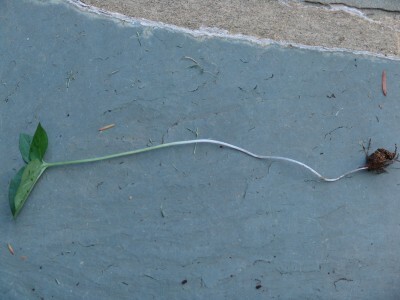 As a result, hand-pulling is nearly always ineffectual in ridding a garden area of Pinellia. The best method I have found for dealing with Pinellia is to push a hori-hori (Japanese digging knife) or other digging tool deep enough in the soil (a few inches) to excavate the entire plant. Success is achieved if the removed plant still has a spherical corm attached to its long white stem. P. ternata thrives in the mid-Atlantic region and, left on its own, is capable of nearly doubling in population every year. However, with consistent and accurate weeding, it is possible to control the spread and reduce the pervasiveness of Pinellia in your home garden. Just be sure not to dump Pinellia in your compost pile; instead, tie it up in a plastic trash bag to prevent it from spreading its weedy ways. Until next time, good luck in your weeding adventures and happy gardening! Pinellia ternata was widely sold 10 or 12 years ago in Southeastern PA as the only Pinellia that wasn’t invasive. In it’s EARLY years in our garden it was a delightful plant but in 6 or 7 years it gets entrenched and the plants begin to appear further and further from the parent clump. I agree it should only be grown by those who understand it’s true nature. It could easily become problematic. Last year I saw a new variegated form that was very tempting and I’m sure many have a tiger by the tail. When we first saw Pinellia ternata, it was growing in a newly built raised bed that had been filled with fresh soil . I am glad that I saw a picture of it in an id of invasive plants book that I had purchased recently. I wrongly thought that it was some kind of Jack- in- the -Pulpit and was going to plant them in my garden at home. I would seriously look out for these “cute ” little pulpit look-alikes in soil brought in when preparing a new garden site or raised beds! This is what seems to have happened to us , as I certainly hadn’t seen hide nor hair of them prior to the raised beds being built and filled with soil. I have been fighting this monster weed for over 15 yrs. Don’t know from whence it came, but i may be responding to Trichlopyr (Ortho). We have not been able to correctly identify it until today from the wonderful Atlantic Co. Extension agent. Digging it out – corm and all, is not enough. It keeps spreading by the corm and gazillion rhizomes. extending from the corms (or nuts). Pinellia is one of the most pernicious weeds in the gardens at Swarthmore. We have eliminated it from some garden areas, but only by digging out the soil, sifting it through a screen and picking out all the parts of the Pinellia. I am purchasing manager for the raw material of oriental medicine. You describe pinellia as a pernicious weed. If you want to know pinellia value as a medicine, feel free to contact me. I am so glad that a friend directed me to your site. My wife and i have been driven crazy battling this pernicious invader. We are in the Baltimore area, and until just now, nobody has been able to identify this pest for us. All our control efforts have failed. We got some plants from a public garden in Baltimore some years ago and thought that the pinellia must have arrived with them. However people who work there said they were unaware of this weed, which surprised us greatly. But now another possibility presents itself. Our son was a student at Swarthmore College some years ago–so maybe it hitchhiked on his shoes or something (he was not a gardener then!). So glad I found this site. I have been trying to identify this weed in my garden forever it seems. This plant appeared in my vegetable garden 3 years ago. It has spread exponentially. I have not been able to get rid of it by digging and letting it rot away in plastic bags. There are just too many corms and I can’t seem to get them all. A very large area is affected so sifting the soil seems like a Herculean task. Would covering the soil with black plastic help? Or weed fabric? Would it kill the corms? Penny, I have moved big rocks in my garden only to find the pinellas I hoped to suffocate are still there and growing vigorously after two years! The only difference is lack of color, which they quickly regain. I spoke with a professional gardener friend of mine. He told me the only thing that will keep it under control (not eradicate) is a over the counter spray designed to kill poison ivy. Even using the spray, there are problems: 1/ there are literally hundreds of tiny seeds and corms in the soil that haven’t sprouted so one good spray won’t get rid of the future generations 2/ these plants are so hardy that often one application won’t do it. You need to go back after a couple weeks to reapply. I intend to keep after them with the spray. Digging them out is thankless and futile. I’ve thrown my organic principles to the wind and will use the spray if that’s what takes to save my garden. Thanks to this site I have now identified this invasive plant in my gardens! Digging it up corms and all has not been successful. This year it is coming up in my compost pile – quite upsetting! Will have to dig the whole thing out and start over I suspect. I try to stay organic but will be resorting to poison ivy spray. Thanks for the advice! We have been battling Pinellia for over a decade with mixed results. I’ve successfully removed all Pinellia from my 30′ by 20′ vegetable garden by stubbornly digging them up to get the entire plant, including the bulb at the base and another bud partway up the root. I was not alway successful because the plant pulls away from the bulb easily. But it prevents the plant from seeding (very important!) and the plant that comes up the next year is a little weaker than the first one and offers another opportunity to dig it out completely. i had fewer and fewer plants every successive year and none the last two years. However my wife has not been able to eradicate them from her flower garden. The reason is simple; many of the flowers are perennial and the Pinellia is tucked inside their root system making extraction impossible without harming or even killing the plant. Vegetables are mostly annual and so losing a plant or two when digging up the Pinellia is not a big deal. You can always plant another one. The solution for a flower garden is to probably to start with nothing with annuals, stubbornly dig out the Pinellias whenever they appear (even if you lose the annual), and then add perennials only after you have successfully wiped out all the Pinellias. After that, vigilance! I, too, have been dealing with this horrible week for years here in Minnesota. I used to really enjoy gardening and have extensive annual, perennial and vegetable gardens but am wishing that a big front loader would come in and dig EVERYTHING up! Forget about organic gardening, I’ve tried Round-Up in all forms and even a blow torch!!! Covering it with black plastic or weed cloth doesn’t help. If you lift it up you will find a mass of stems just waiting to erupt! ! won’t give any plants away and insist that if someone digs in my garden, they are to use my tools to avoid spreading anything to other gardens. But now, thanks to Madeleine, I’m about to go out to find some poison ivy spray and have my fingers crossed. gardens at Foulkeways at Gwynedd, where I now live. ah (or better say: oy!!) pinellia!! :((((( finally have a name for this monster. gave a large part of a garden to the 2 pot bellied happy pigs!!! they have done a great job digging up and eating everything in site!! now, I plan to remove more desirable plants and give them more space to clear!!! it is the most invasive thing I have ever experienced!!! this is a monster- gave garden to pot bellied piggies to dig up. wondering how long it will take till I can plant there again!! For those first spotting Pinellia, it often hitch-hikes on plants shared from an infected garden. If I see one “green dragon” leaf, that shared plant gets booted out along with a wide margin of soil around it. Probaby a good idea to plant nothing (bark chips? )or annual in that spot to be sure no more returns.